Toju-en Garden (藤樹園) is one of Bonsai Garden in Bonsai Village. 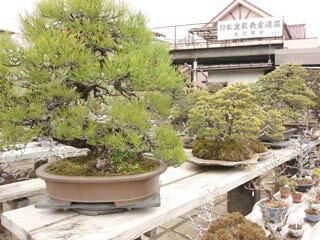 It is also Bonsai School which you can learn how to Bonsai. There are hundreds of Bonsai arts displayed in this garden. Japan is the nation of islands with four seasons, and most of Japanese lands are mountains. Bonsai was born by living with Japanese nature. Bonsai is the art to enjoy Japanese nature in your space and heart. You enjoy Japanese Nature and take the great impression of it to your Bonsai. Bonsai express your poem. Admission: 5.000 yen for entry, and 6,000 yen for monthly tuition. Professional instructors will teach you how to take care and grow Bonsai from the basic techniques to advanced techniques. Bonsai is also "Do," the way of Japanese art. The school teaches you not only the techniques, but also teach you the heart and sprits of Bonsai-do. Later, you will understand the art form of "Wabi" and "Sabi," the most important emotional sense to understand Japanese art and beauty.